We’d love your help. Let us know what’s wrong with this preview of A Long Goodbye by Anthony Le Moignan. To ask other readers questions about A Long Goodbye, please sign up. Let me just get a tissue!!! I am not into romantic novels but this has melted my granite heart!! Emma and Michael are having marriage problems mostly caused by him working away during the week and her long hours managing Orchard Care Home. Simon enters the care home at 40, he is the youngest resident and is physically fit, but has the early onset of Alzheimer’s. Their friendship and flourishing romance was very touching and beautifully written. I did tear up when Simon’s condition deteriorates but Let me just get a tissue!!! I am not into romantic novels but this has melted my granite heart!! Simon enters the care home at 40, he is the youngest resident and is physically fit, but has the early onset of Alzheimer’s. Their friendship and flourishing romance was very touching and beautifully written. I did tear up when Simon’s condition deteriorates but it was so realistically written and wasn’t dramatised!! I loved this book. A romantic story with a twist that was heartbreaking and at the same time so emotionally touching. The friendship between Michael and Simon was so unexpected but so gentle that you can’t help but be moved by it. I have never read a book with a character that has Alzheimer’s, but this was tastefully written and obviously researched. Looking forward to Anthony’s next book. It’s clear that this book has been written from the heart. Recommended for lovers of contemporary romance, it’s 4 stars for “A Long Goodbye” and I wish Anthony Le Moignan all the best with this and future novels. A Long Goodbye is contemporary romance novel set in the somewhat unusual setting of a care home in Cambridge. Simon is an accountant, a successful one. He’s sporty with a love of running, not just the taking part but watching other athletes and reading the magazines as well as challenging himself to beat his personal best. He’s funny, good-looking and he has been diagnosed with Early Onset Alzheimer’s disease. He is just forty years old and faces the challenges ahead with fortitude and a sense of A Long Goodbye is contemporary romance novel set in the somewhat unusual setting of a care home in Cambridge. Simon is an accountant, a successful one. He’s sporty with a love of running, not just the taking part but watching other athletes and reading the magazines as well as challenging himself to beat his personal best. He’s funny, good-looking and he has been diagnosed with Early Onset Alzheimer’s disease. He is just forty years old and faces the challenges ahead with fortitude and a sense of humour. Emma works at Orchard Care Home, a residential home that usually houses the elderly who need to have the love and support of their professional team. Emma is married to a man she met earlier in her caring career, she’s now managing the home but keeps her hand in with the patients. Her husband Michael has meanwhile risen through the ranks and now works away for much of the time which combined with the lack of a much-wanted baby has left their marriage much in need of some tender care. Anthony Le Moignan’s book is based on facts, his father suffered with Alzheimer’s, and so while he creates a story that pulls at those heart-strings, he doesn’t use his fiction to create either a totally unrealistic portrayal of this cruel disease but nor is it in any way sensationalist. The story is lovely, the characters a wide variety from the obviously kind and caring Emma to a real doozy of a money-grabbing woman who makes an unwelcome appearance during the story. 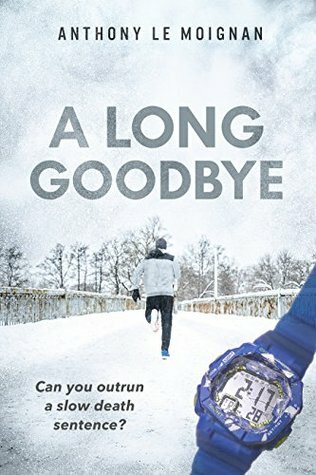 I was worried that A Long Goodbye would be too saccharine sweet for my tastes, but it wasn’t, far from it, I actually found it to be a thoughtful novel, with many of those truths that I suspect we all look for within the books we read and no, these are not all specifically related to the Alzheimer angle. The story moves along at a pace with some tender moments that bought a tear to my eye so have the hankies at the ready! A well-written novel that explores love from a variety of perspectives and yet balances this with some genuinely funny moments with a real feel for the characters. A great debut and I for one will be looking to see what the author comes up with next. It's taken me a while to gather my thoughts on this book and even now after a few weeks this beautiful story is still at the very forefront of my mind. On the outside Simon has it all. He's a successful accountant, funny, handsome, financially comfortable and he's still only in his forties. But on the inside he's falling apart as he's been diagnosed with Early Onset Alzheimer's. Determined not to become a burden to others he has been busy preparing for his uncertain future and checks himself into It's taken me a while to gather my thoughts on this book and even now after a few weeks this beautiful story is still at the very forefront of my mind. On the outside Simon has it all. He's a successful accountant, funny, handsome, financially comfortable and he's still only in his forties. But on the inside he's falling apart as he's been diagnosed with Early Onset Alzheimer's. Determined not to become a burden to others he has been busy preparing for his uncertain future and checks himself into Orchard Care Home where he hopes no-one will find him and he can quietly live out whatever remaining time he has left. Emma is the manager at Orchard Care Home. She takes pride in what she does and she is supportive of both the residents as well as her team of staff. She's worked hard to get to her current position of manager and she met her husband, Michael, through her work earlier in her career. The couple are forced to spend a lot of time apart as Michael has now moved further up the career ladder and this has put a lot of strain on their marriage. When Simon and Emma meet it's obvious that they are attracted to each other but of course this is a situation that is never going to end well for a whole host of reasons. I was totally immersed in the story and it's characters. I loved Emma as she clearly loved her job caring for those who were unable to care for themselves and watching her relationship with Simon flourish knowing that there would only ever be one possible outcome really tugged at my heartstrings. Simon was a character that will stay with me for a number of reasons, one of which being that a close family member had dementia, so I fully appreciate how difficult it can be to deal with. Seeing his decline from the humorous, happy go lucky guy at the start of the novel through to when his condition really starts to take a hold made for some really emotional reading but the fact that it was so beautifully written somehow made it easier. A Long Goodbye is one of the best, if not THE best book that I've read this year. It's a highly emotional, poignant and thought provoking story which is based on real life experience of this heartbreaking condition as Anthony Le Moignan's father was diagnosed with Early Onset Alzheimer's and this first hand experience is very obvious in his writing. I'm not ashamed to tell you that this book completely broke me to the point where I was ugly crying into my pillow. I honestly can't recommend this highly enough and proceeds from the book will help to support the Jersey Alzheimer's Association so you'll be helping a great cause as well as getting a wonderfully touching, funny, heartwarming and hopeful story at the same time. I have loved reading this book. The characters pull at your heart strings and you feel like you know them for real. The very quick progression o Simon is extremely wealthy, a successful accountant and struck down with very early onset Alzheimers. Emma is married in a sort of a stuck in a groove marriage and is the manager of a Care institute. This is her life and she loves her work. A Long Goodbye is a contemporary romantic read. It is beautifully written and was hard to put down. I LOVED this book and read it in one sitting! It's a heartwarming tale, the characters really tug at your heartstrings. A Long Goodbye is one of my favourite 2018 reads and definitely my favourite book on Alzheimer's. I cannot wait to read Anthony Le Moignan's next book! Full review will be up on my blog. Emma is in charge of Orchard Home Care, a career of caring which she lives for. Her marriage is falling apart over fertility issues. Mixed up bouquets of flowers with different messages make matters even worse. Meanwhile, enter Simon. At 41-years-old, he is rich, successful, and newly alone with the diagnosis of early-onset Alzheimer’s. He is by far the youngest resident to enter this senior care facility. An active runner and sweet joker, Simon and Emma begin to form an indescribable bond fille Emma is in charge of Orchard Home Care, a career of caring which she lives for. Her marriage is falling apart over fertility issues. Mixed up bouquets of flowers with different messages make matters even worse. Meanwhile, enter Simon. At 41-years-old, he is rich, successful, and newly alone with the diagnosis of early-onset Alzheimer’s. He is by far the youngest resident to enter this senior care facility. An active runner and sweet joker, Simon and Emma begin to form an indescribable bond filled with compassion. Simon would be impossible not to fall in love with. The man gives his house to a homeless teenage girl and her cat, for goodness sake. No blurb can really do this book justice! A Long Goodbye is a deeply emotional exploration of love, loss and caring that left me completely drained, but in a good way. Le Moignan avoids the trap of introducing too many characters and keeps the focus tightly on a core few (Emma, Simon, Michael), with a handful of peripheral side characters (most notably Julie and Maddie). The reader gets to know these few characters intimately and they feel utterly real: not ‘baddies’ or ‘goodies’ but authentic complex people with their own motivations and justifications. Perhaps excepting Simon, who is an angel through and through! It was obvious from the overall theme of the book that this was going to be a tragic love story. Le Moignan’s portrayal of Early Onset Alzheimers is heartbreakingly honest; raw but sensitive. Simon’s decline is almost unbearable to watch, but it is his approach to his illness, and life in general, that won my heart and had me sticking by him to the last page. Not to say that the whole story was doom and gloom! This is a romance, after all, so we see a fair helping of coincidental meetings, communication mix-ups and comical misunderstandings. Plus the upbeat attitudes of the main characters really help to keep the pace lively and leaven the greyer moments. Whilst Simon’s story arc was somewhat predictable given his circumstances, those of Emma and Michael took some totally unexpected turns, and I really enjoyed how the characters had the capacity to surprise me right to the finish. Especially at the finish! A Long Goodbye is a deeply moving story of love, not just between a man and a woman, but between friends, lovers, parent and child. Love that transcends illness, memory and painful experiences. I highly recommend this book, but please make sure you stock up on tissues and have some hugs on standby (pet, partner or just a favourite teddy). The consensus was that his illness would grant him between three and twenty years from the first symptoms. He’d already had a good five of those since first noticing people staring in an unfamiliar way, wondering why he’d repeated himself or didn’t know their names. His last relationship had ended after forgotten dates and ‘being weird‘. He’d assume there were five years left, the latter half veering towards an unacceptable standard of life. For the moment, he was still healthy in his body, if not in his mind. He intended to keep that level of fitness up for as long as possible. Simon is living a successful life but when he is diagnosed with early onset Alzheimer’s while in his thirties he determines to have some control over his future. He retires as a partner in his accountancy practice, sells his house and moves into an apartment close to Oxford. Some eighteen months after the diagnosis, he decides to move into a care facility for the final years (?) of his life. He chooses Orchard Care Home, a care facility that has a pool and a gym and plenty of room for him to continue his daily running exercises. Of course, he is many years younger than the other residents but he soon settles into this new way of living. Emma is the facility manager and has been in the care industry for twenty plus years. She is married to Michael whom she met when a trainee at Orchard. Michael from being the manager has moved up the corporate ladder and is now based in the company’s London office, This entails the couple spending much time apart. The attraction between Simon and Emma is immediate, but while attracted Emma is well aware of her marriage vow and her responsibilities as manager of the care home. If you read this book, and I encourage you to do so, be prepared to range through all your emotions. It is at times, heartbreaking, and at others funny, loving and sensational. I recommend this book with five stars. This is Anthony Le Moignan’s first book. I trust it will not be the last. The attraction between car Simon, a successful accountant, has a big problem. The biggest of them all. He checks himself into Orchard Care Home whilst still relatively healthy, the youngest resident by decades. He’s confident he cut all ties with the outside world and is untraceable. What a beautiful, sad and utterly absorbing story! I found myself engrossed from the first sentence and when I finished the book I felt bereft; as if I'd lost someone I'd felt very close to. I am not surprised this story is based on the author's experiences with his father, another Alzheimer's patient. Simon is a wealthy young man who learns he has early onset Alzheimer's and when he reaches the point where he feels he needs to cut off all ties to the outside world and reside in a safe, caring p What a beautiful, sad and utterly absorbing story! I found myself engrossed from the first sentence and when I finished the book I felt bereft; as if I'd lost someone I'd felt very close to. I am not surprised this story is based on the author's experiences with his father, another Alzheimer's patient. Simon is a wealthy young man who learns he has early onset Alzheimer's and when he reaches the point where he feels he needs to cut off all ties to the outside world and reside in a safe, caring place where he can let nature take it inexorable course. Upon moving into Orchard Care Home Simon meets Emma, the manager. Their connection is instant and deep. Emma and Simon both know their time together is limited, particularly by the fact that Emma is married, but their love is a driving force which ultimately changes several lives. A stunning, well written story which will affect anyone lucky enough to find themselves with a copy of it. Very strongly recommend. "Some people do very kind things. Special things that make a whole world of difference to a person or a persons' lives." What a story! Simon has been diagnosed with early alzheimer's disease at the age of 40. Thinking calmly, he plans his future and moves into a nursing facility. He feels safe and knows the caretakers will become family and help him. Was he planning on falling in love with the manager of this wonderful, special place? For how long will he know her name? How long will he even remem "Some people do very kind things. Special things that make a whole world of difference to a person or a persons' lives." Was he planning on falling in love with the manager of this wonderful, special place? For how long will he know her name? How long will he even remember who he is? It's a heartbreaking and yet hopeful book. Wow what a beautiful love story. This truly was written from the heart. Anthony Le Moignan is on par with Nicholas Sparks. This story follows Simon, who has early onset Alzheimer’s, how Simon sees things and forgets things brings to light what a cruel disease Alzheimer’s truly is, yet at the same time the story makes you realise you have to live your life to the max ! I could envision all the settings so clearly, it was like I was there in the story. I loved this book, it’s a story that will sta Wow what a beautiful love story. This truly was written from the heart. Anthony Le Moignan is on par with Nicholas Sparks. Picked this up completely by accident. Loved every moment of it. Poignant and beautifully written insight into one of the worst conditions that can befall someone these days, especially when they are only in their forties. Maybe a teensy little contrived at the very end, but all main characters were given a chance to grow and develop, and the plot ticked over nicely, so I didn’t really mind. Now I just wish there was a care home like that when it’s my time! This is a bittersweet, sad, happy, celebration of life story. One minute you’re happy, the next you’re sad. One minute a character really ticks you off and the next minute you find yourself root8ng for that character. The author does a nice job of character development. My only complaint is the ending seems quite rushed. Predictable story but I needed an easy, though sad read after my last book. Would have given better rating if was notpredictable. Characters good.